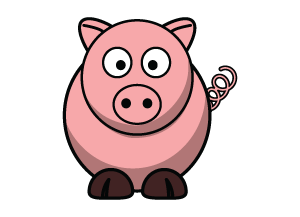 We keep things simple! All prices include shipping in the USA. 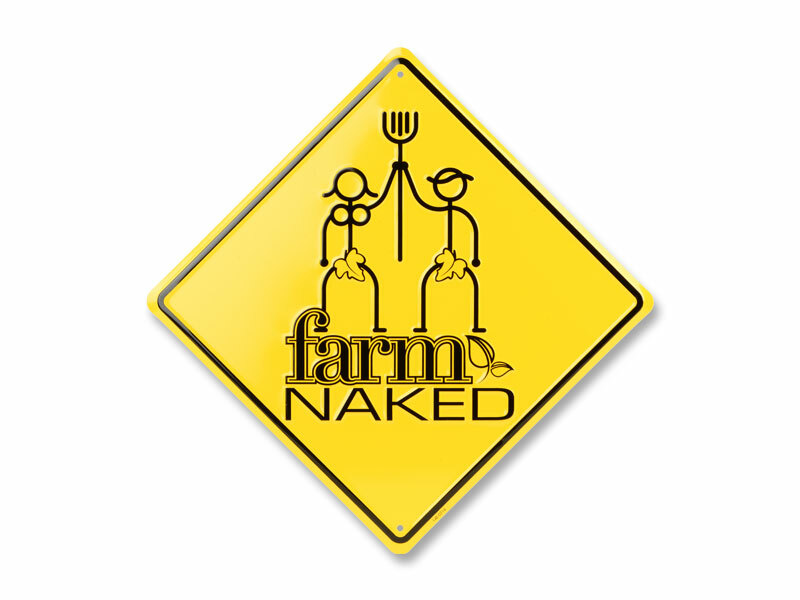 Warning – naked farming area! This weather-proof aluminum sign is sure to get a reaction (or a laugh) from your friends and neighbors. 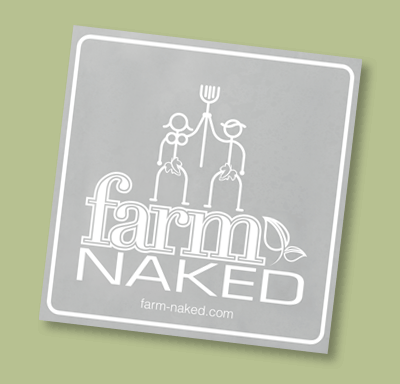 These signs are manufactured from recycled aluminum with the farm naked logo embossed for extra impact. They are printed in a bold black and yellow color combination typical of warning signs. 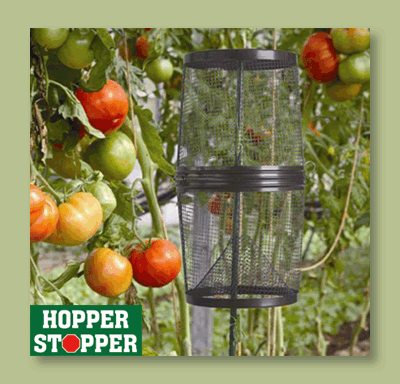 There are two holes to make it easy to hang on a pole, door, fence or the side of your house, barn or shed. 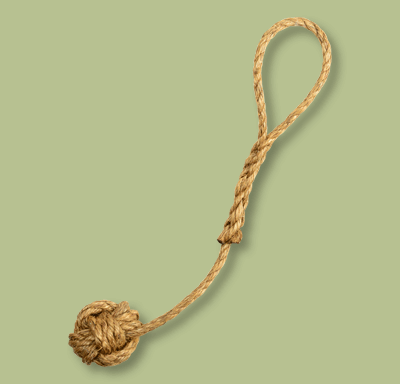 Perfect for lovers of the "au naturel" including the backyard gardener, farming family, or anyone with a sense of humor. Price: $15.00 - Includes Shipping in the USA. We call this the Kurt shirt, since he insists that we offer t-shirts with pockets, since that's all he wears. This preshrunk 100% cotton, 6.1 oz. 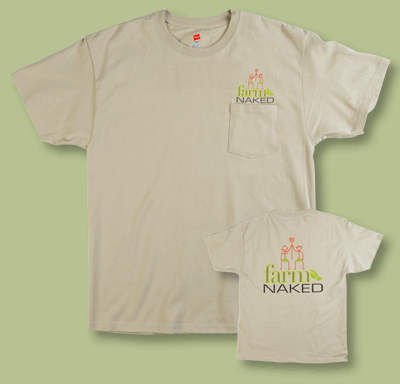 heavyweight, tagless t-shirt is a natural sand color and comes with the farm naked logo over the pocket. It's imprinted using safe, eco-friendly, non-toxic water colors that are baked into the shirt for a long lasting imprint that won't peel off like a silk screened shirt. We couldn't find a pocket-T made in the USA, but this one's from Honduras … so it's still made in the Americas! Price: $25.00 - Includes Shipping in the USA. We searched and finally found a made in USA t-shirt that supports US jobs. 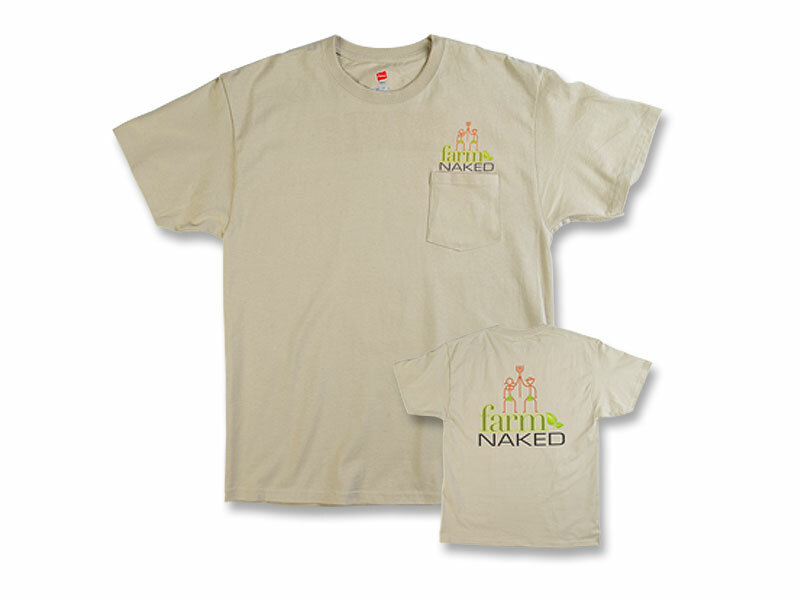 This 100% fine jersey cotton t-shirt has a soft, comfortable feel and comes in an earthy camel color that won't show the dirt when you're working in the garden. 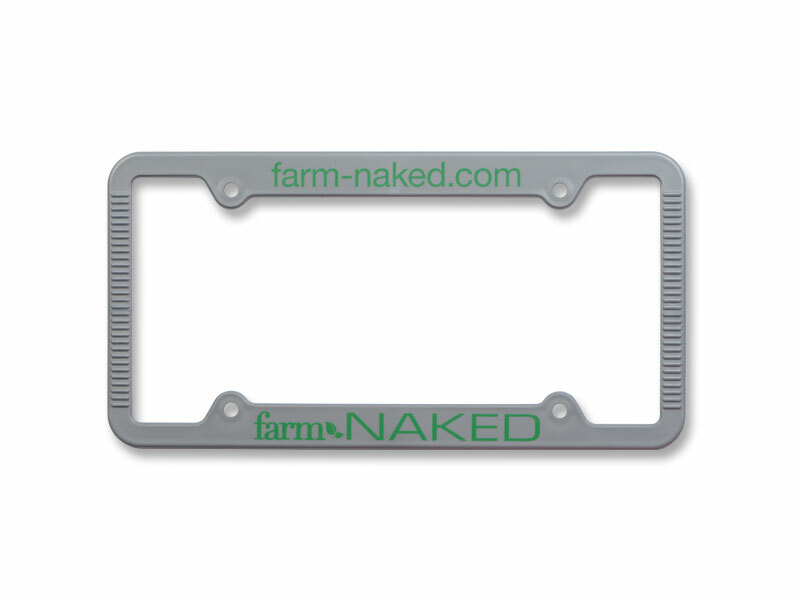 It's imprinted with the farm naked logo across the back to show people you're serious about farming naked. The imprint is done using eco-friendly, non-toxic watercolors that are baked into the shirt, not laid on top using nasty chemicals. Okay, you'll pay a little more, but sleep a little better knowing you're doing something good for the country and the environment. 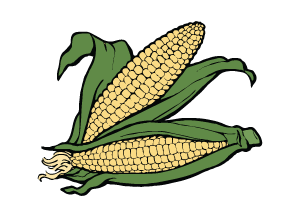 We'll keep you covered when you're "heading" out to the farm, garden or local market. This low profile, softly structured baseball cap is made in the USA by Cap America in Missouri - one of the few companies still making caps in our country today. The soft twill material is instantly comfortable with no break-in time. 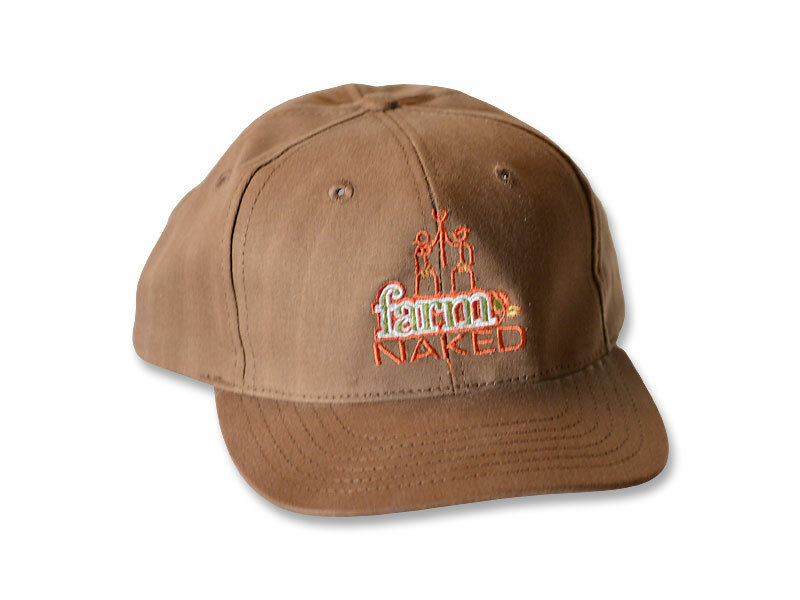 The farm naked logo is embroidered for quality and long-lasting wear. The earthy brown color won't show the dirt after a hard day's work. This cap is a conversation piece that's sure to keep people guessing what you're up to! Price: $20.00 - Includes Shipping in the USA. Price: $26.00 - Includes Shipping in the USA. Horses are prey. They don't fight, they take flight. 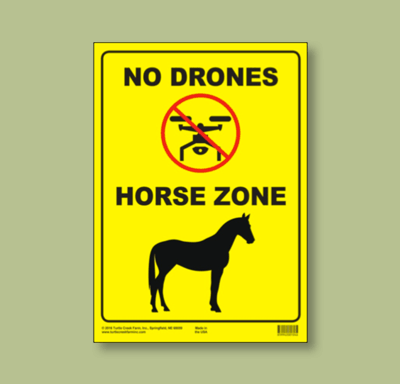 We don't like to think about how our horses might react to a drone. Our goal is to protect horses and the people who handle or ride them. A horse spooks at 45 miles per hour. Damage to the horse, people, and property can happen in the blink of an eye. 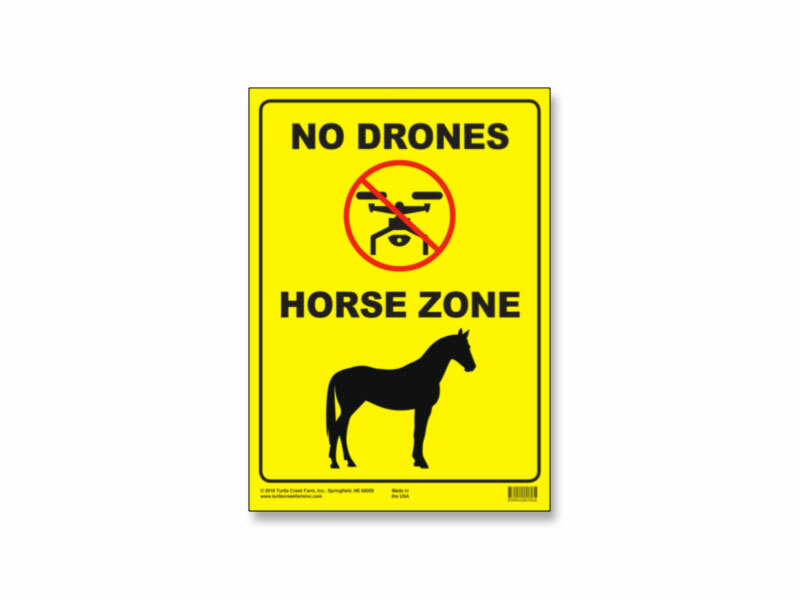 We don't want drones on our property. Chances are other horse owners, boarding or breeding facilities, show grounds, competitions, and racing venues don't either. This made is the USA sign is 10" wide and 14" tall and made of durable, thick 40 point styrene, and printed with UV protected inks that won't fade. It's drilled with two holes for easy mounting. Price: $12.00 - Includes Shipping in the USA. Our friends at Frontier bag in Omaha have been making custom bags at their family-owned business since 1946. 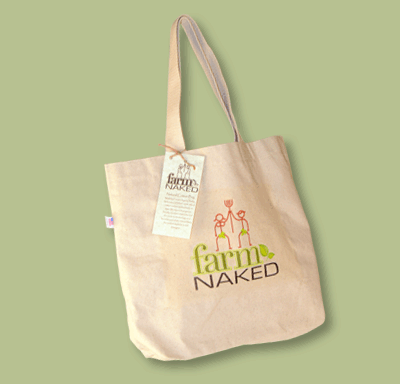 You'll love this durable, heavyweight tote made of 100% natural cotton containing absolutely no dyes. 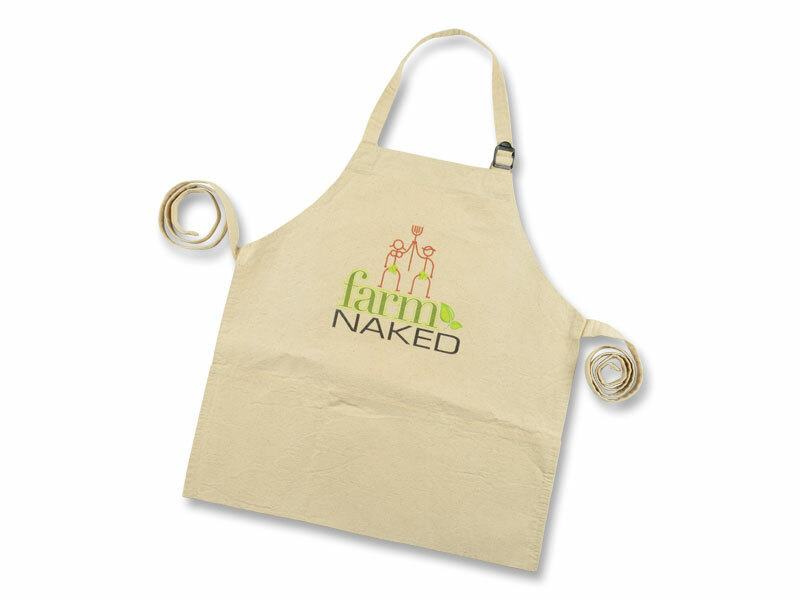 Plus, we imprint the farm naked logo using eco-friendly, non-toxic watercolor and then bake it into the bag, so it becomes part of the natural fibers. This bag measures 20" wide by 16" tall and has super heavyweight handles to carry even the biggest loads of organic produce, meats, or anything else. It's machine washable, so take it out whenever you're pickin' or shoppin". Price: $18.00 - Includes Shipping in the USA. 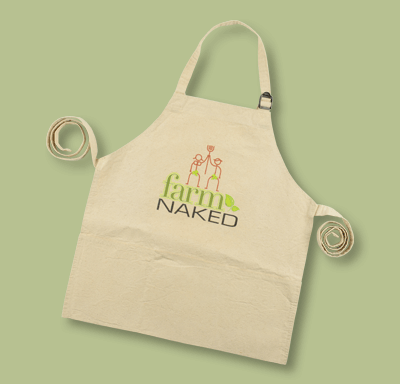 Our friends at Frontier Bag in Omaha, Nebraska designed and manufactured this apron especially for farm naked. 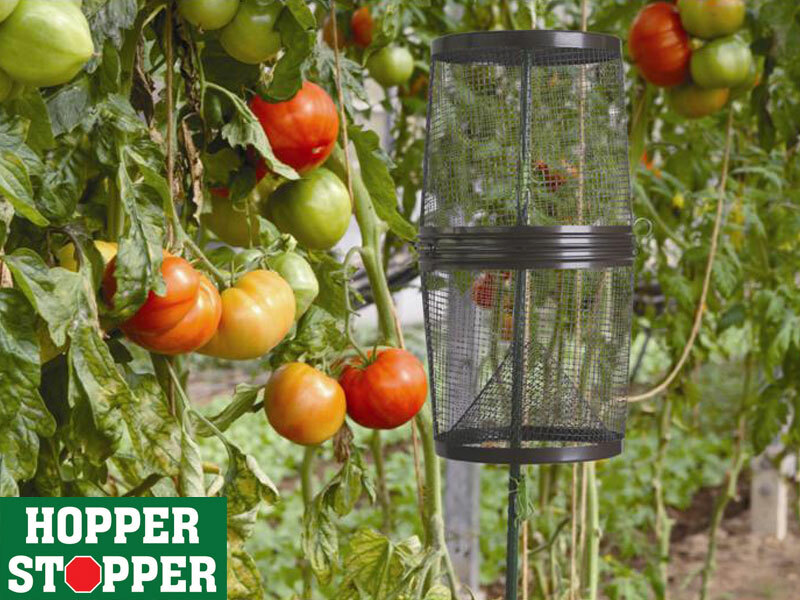 We can't decide if it's better suited for the kitchen or the garden, so we'll leave that up to you. It's got three handy pockets in front for holding seeds, tools, or tags. 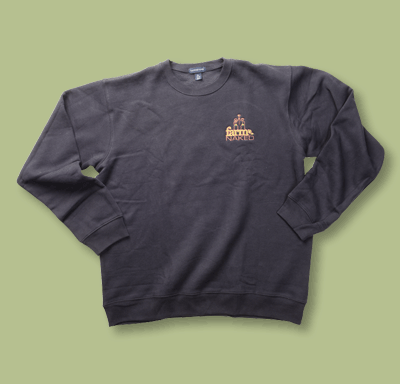 It's made of rugged, heavy weight 100% natural cotton containing absolutely no dyes. 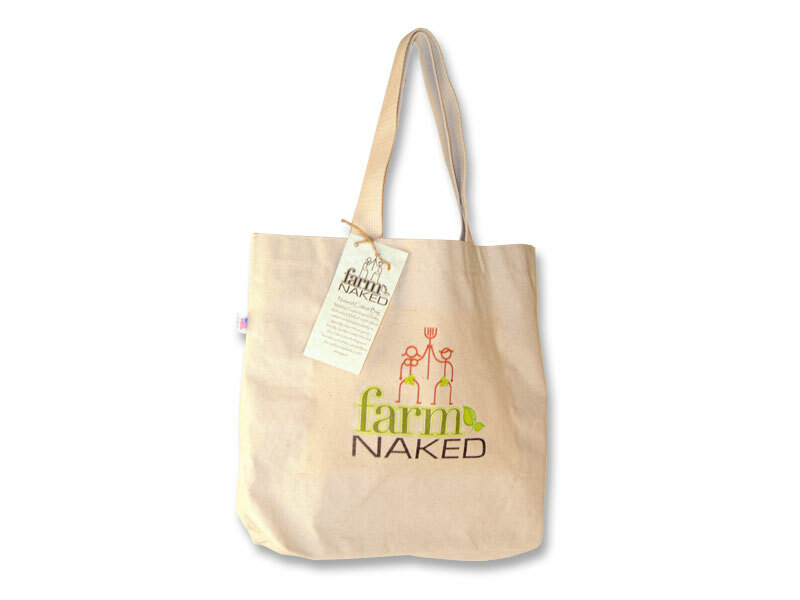 The farm naked logo is applied using a special process with eco-friendly, non-toxic watercolor inks which are baked it into the bag, so the imprint becomes part of the natural fibers. Price: $23.00 - Includes Shipping in the USA. This made in the USA, 3" x 9" bumper sticker magnet is reusable, repositionable and reliable. It won't leave any residue on the surface, like a traditional bumper sticker. 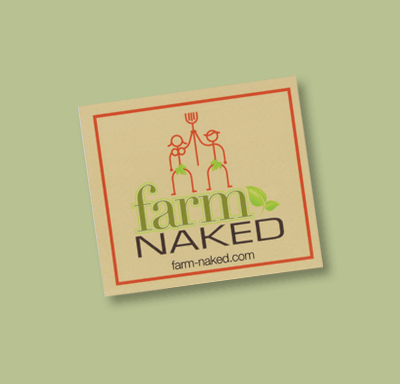 Printed with the farm naked message in four color, you'll let the community know you care about living healthy and protecting our environment. Whether you display it on your vehicle or any other metal surface, it will get you the attention you deserve! Price: $8.50 - Includes Shipping in the USA. 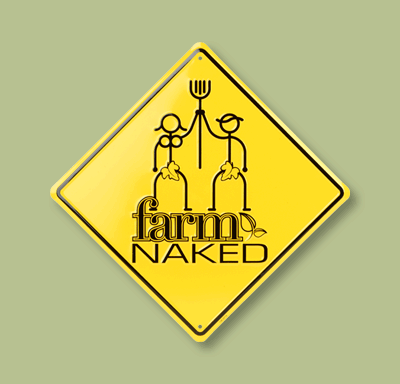 Honk if you farm naked! These high quality bumper stickers are made of durable, flexible vinyl and feature an "ultra removable" adhesive that won't leave a residue. 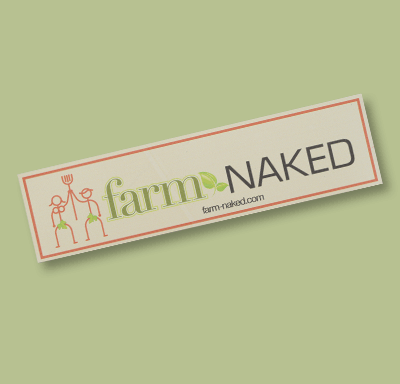 Place one on your bumper, tailgate, garage or barn door, tractor, or other equipment to pledge your allegiance to the farm naked movement. They are 3" tall and 9" wide and printed in a bright black and yellow that's sure to get attention. Price: $5.00 - Includes Shipping in the USA. 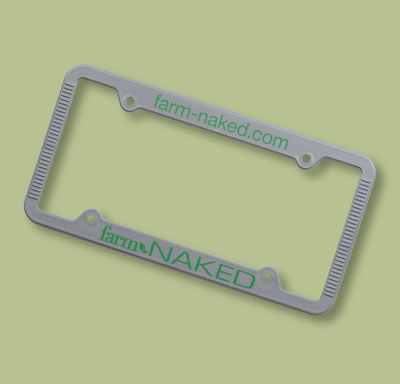 Show your commitment to a chemical-free, natural lifestyle with the farm naked custom recycled license plate frames. This silver gray license plate frame is made from 100% recycled electronics, so it's eco-friendly by keeping waste out of the environment. Economically priced, you'll want to buy one for the front and one for the back of your vehicle, whether it's a pickup or Prius. Pair this with the window decal for maximum messaging. Price: $6.50 - Includes Shipping in the USA. 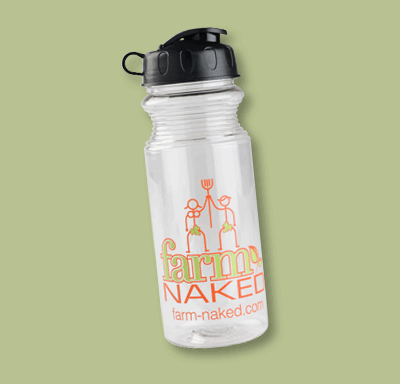 This BPA free bottle is a refreshing and green way to quench a healthy thirst! This 21 oz. eco-friendly bottle is molded from BPA free plastic in an easy-to-grip, contoured shape and features a protective dome cover and push-pull lid. 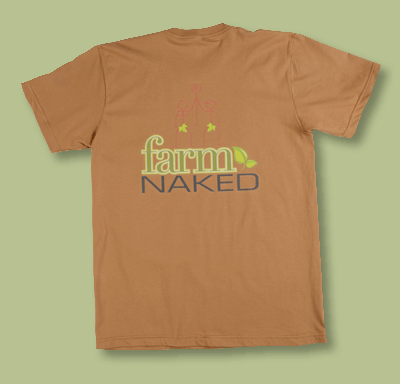 It's printed with the farm naked logo in two colors. 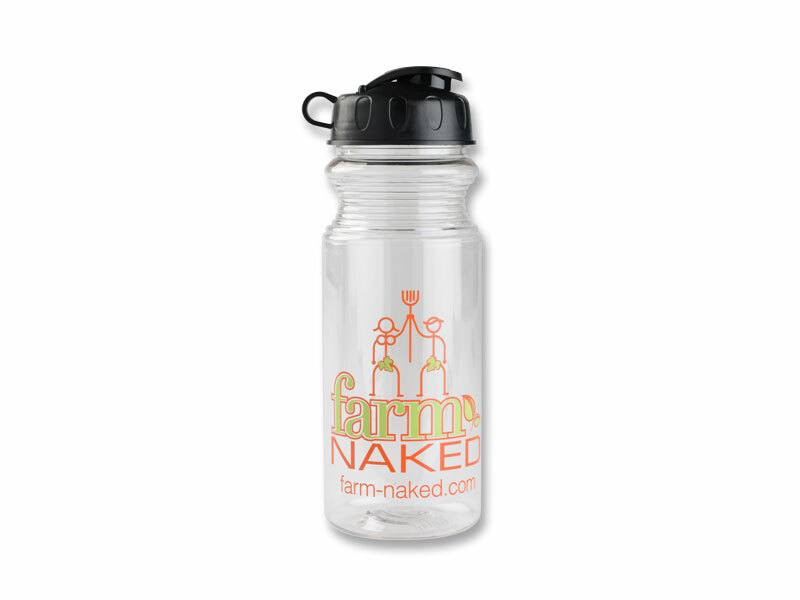 Fill it with fresh, pure water to keep you healthy and hydrated! Price: $7.50 - Includes Shipping in the USA. Bottoms up! Here's a classic drink ware piece that holds 16 ounces of your favorite refreshment or libation. These Mason Jars are made of clear, heavyweight Libbey glass and come without a handle just like the old-school versions. 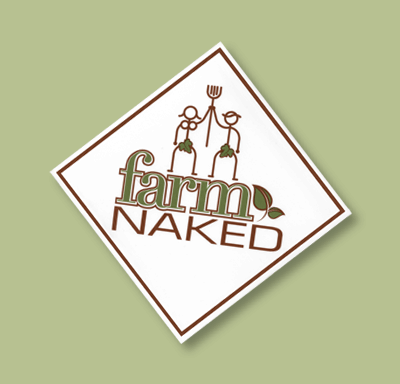 The farm naked logo is screened on the side in an earthy, bronzy brown for a natural look. 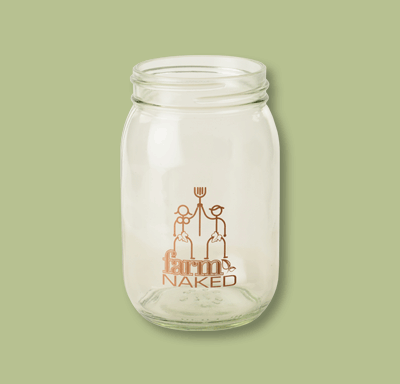 Buy a set to share with friends and family and toast to the freedom of farming naked! Price: $8.00 - Includes Shipping in the USA. What a great way to remind you to make healthy eating choices! 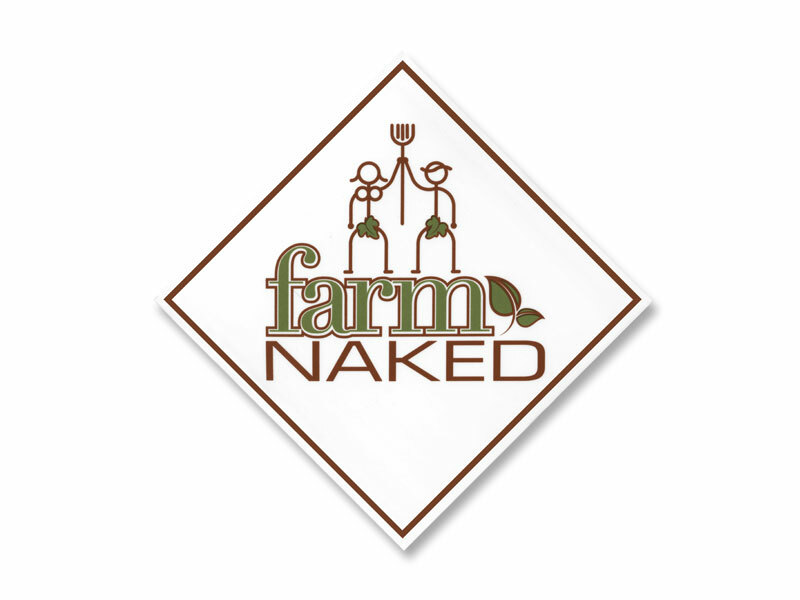 This 3.5" x 4" magnet printed in full color with the farm naked logo is sure to make you smile every time you open the refrigerator door. True to our commitment to buy local, this magnet is made in the USA. 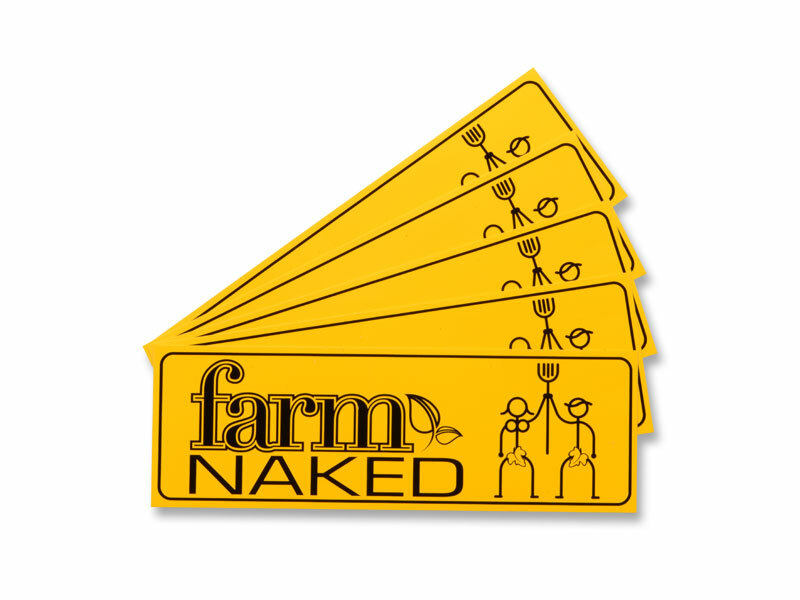 Put on in your kitchen and another in on your file cabinet to show your coworkers you're a fan of the farm-naked lifestyle. Price: $3.50 - Includes Shipping in the USA. Show your support for natural, organic, or chemical-free living by sticking to your principles! 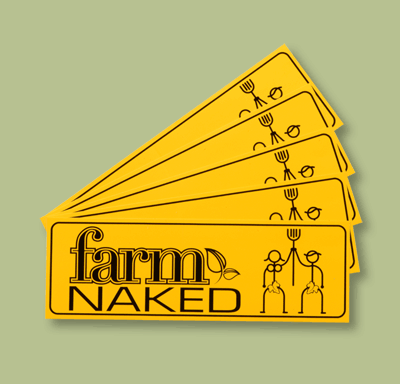 This bright yellow and black sticker with the farm naked logo shows you're proud and serious about making a difference. It's 3" x 3" and printed on a durable, moisture-hardy white vinyl with back adhesive. Buy a few and share them with friends and family. A great conversation piece! Price: $2.00 - Includes Shipping in the USA. This 8" x 8" custom printed static window clings is an excellent way to say you believe in a natural lifestyle. 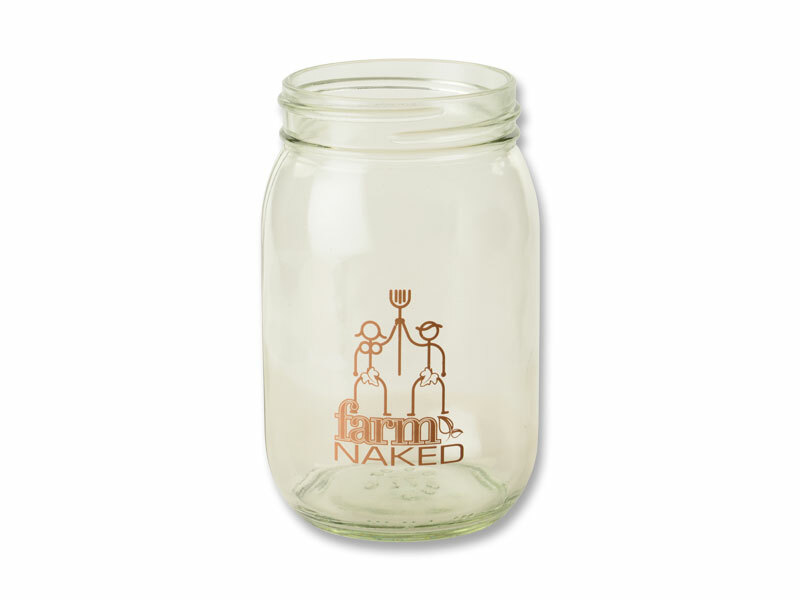 This made in the USA clear cling is screen printed with the farm naked logo in white. 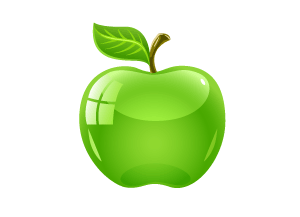 It simply applies to the inside car window or glass door or window. 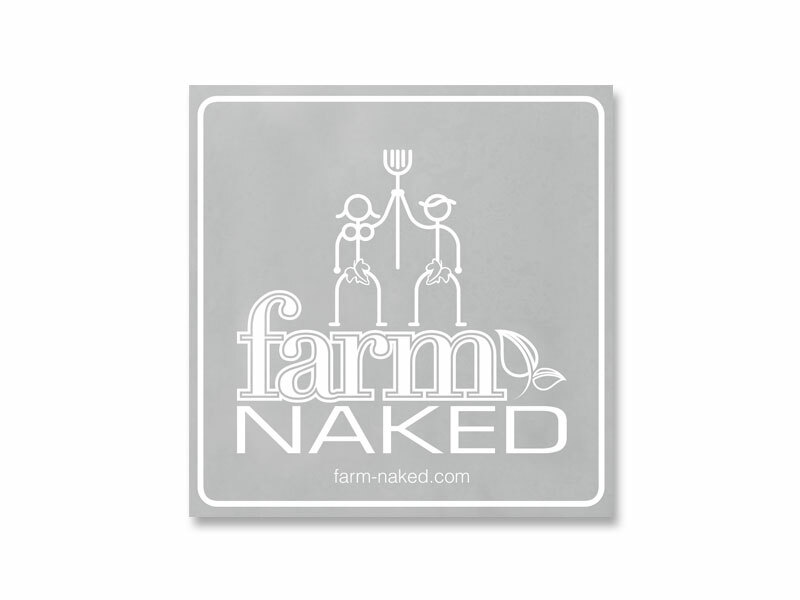 Place it on the inside of windows or any glass surface to let your friends and community know that you're committed to the farm naked lifestyle. 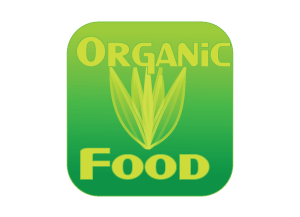 Share the organic, natural and chemical-free living lifestyle with your friends and neighbors. 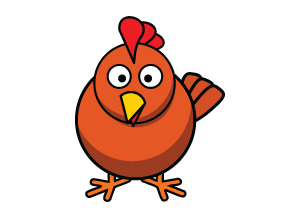 It's an attention-getting and humorous way to promote healthy living. This 9" x 9" yard sign is made of durable white poly reflective laminate, so it won't chip or crack in harsh weather environments and will last outdoors for years. Put one in your yard, or better yet, your garden as a reminder to be kind to your plants, the environment and most important … yourself! Price: $9.00 - Includes Shipping in the USA. 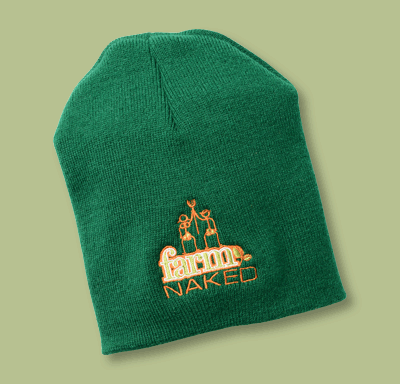 This USA-made knit cap comes from CapAmerica of Missouri with the farm naked logo attractively embroidered into a dark green knit that won't show the dirt after a hard day of work. It's a contemporary-styled pro-rib Tompkin knit cap that is perfect at harvest time, for early spring and fall winter garden planting and clean up, or for just running around town or campus during cool weather. It's a great way to farm naked and keep warm at the same time! Price: $11.00 - Includes Shipping in the USA. Stay warm when you farm naked! 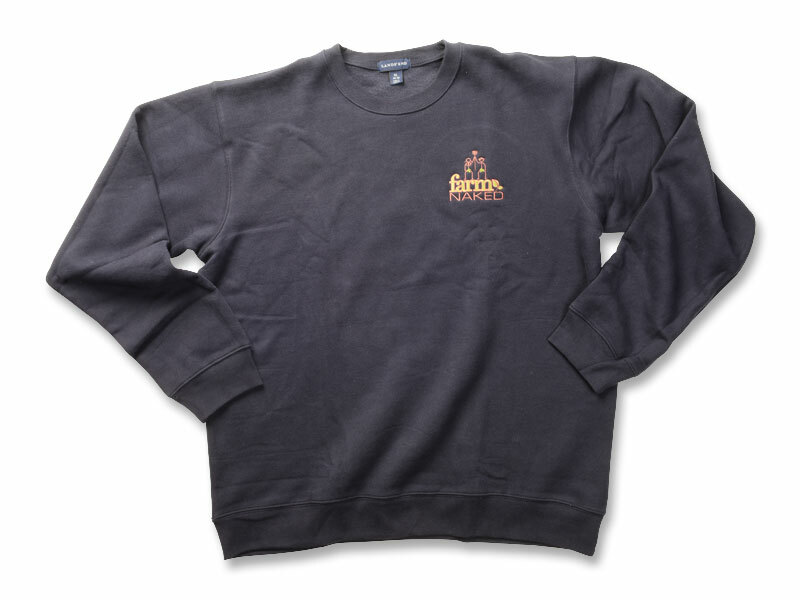 This classic sweatshirt provides serious comfort. It is made of 80% cotton and 20% polyester and is garment washed to eliminate shrinking. 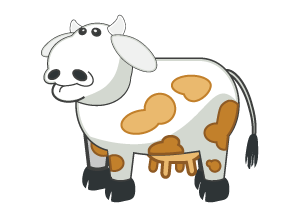 It features sturdy reinforced shoulders and is extra fleecy inside. In a true navy blue, it won't show the dirt or stains from a hard day of gardening, farming or heading to the local farmer's market. 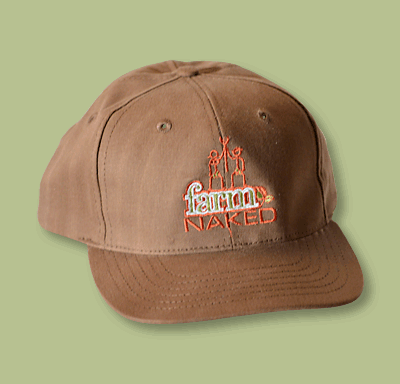 It's embroidered with the farm naked logo for a long lasting impression that won't fade away like imprinting. Price: $43.00 - Includes Shipping in the USA. 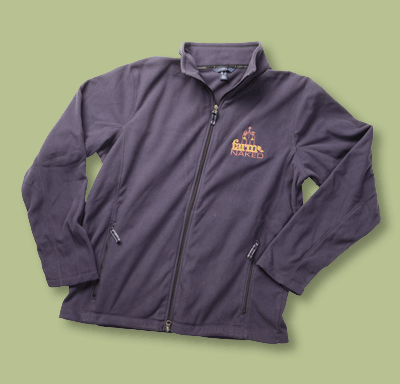 This lightweight, but warm super-soft fleece jacket is brushed inside and out for maximum comfort. It features a full, two-way zip front and two zip pockets and a sporty shape that won't look boxy. The anti-static fabric resists pilling, static shock (ouch!) and lint. It features a higher neck for greater wind protection. Of course, it's machine washable for those of us who like to get dirty. 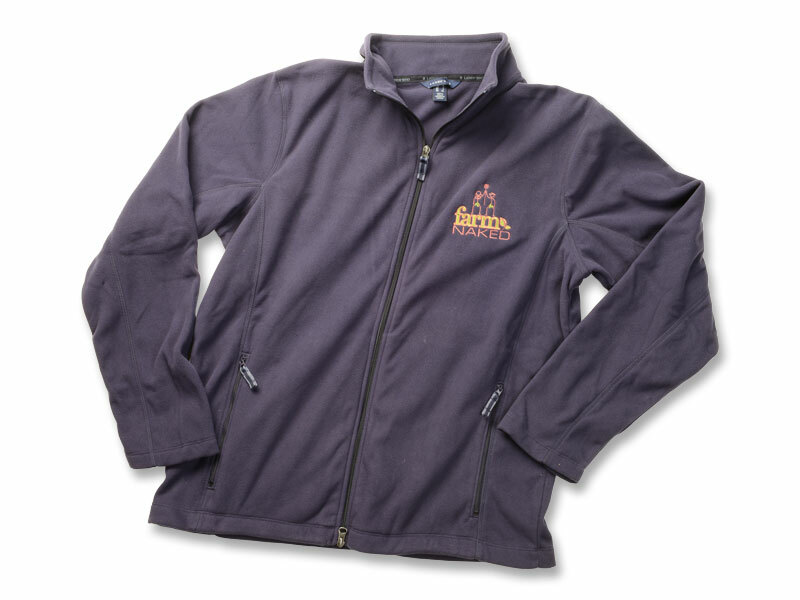 The farm naked logo is embroidered in a contrasting thread on this navy blue jacket. Price: $56.00 - Includes Shipping in the USA. 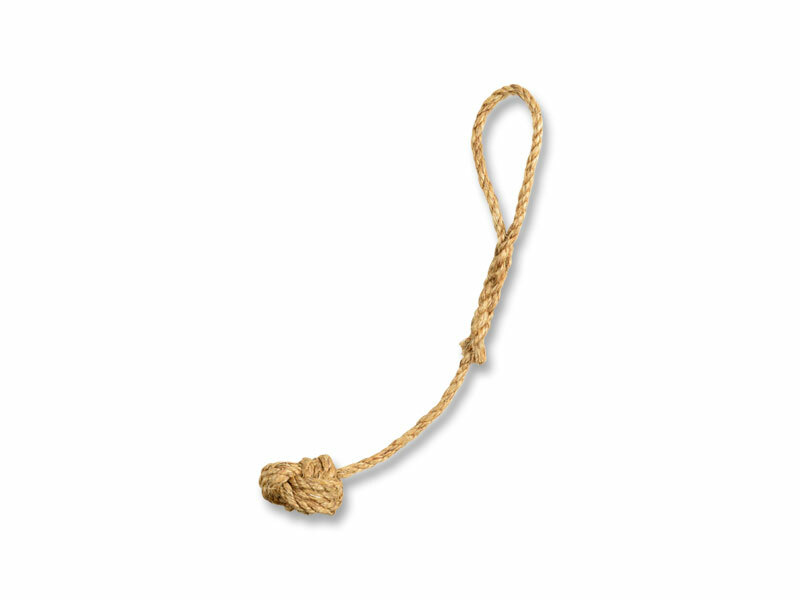 The Rex Rope is named after our Jack Russell/Rat Terrier, or shall we say terror-ier mix. We got tired of looking at labels and always finding pet toys that are made in China that might contain substances that could be harmful. To say nothing that our destructo-dog is tough on toys! 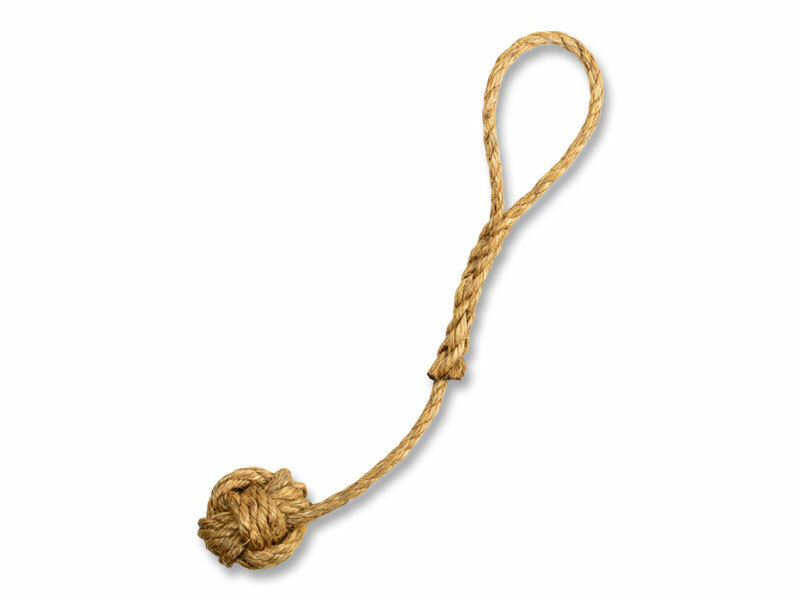 Kurt hand makes these toys out of natural rope braiding a centuries-old knot used on sailing ships called a monkey fist. 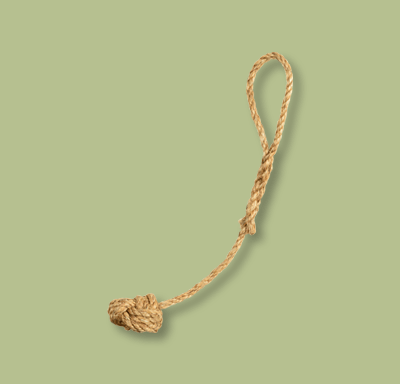 With a loop handle on one end and the knot on the other, this makes a great dog toy for playing fetch and tug-of-war. Every Rex Rope is Rex approved! Price: $10.00 - Includes Shipping in the USA. 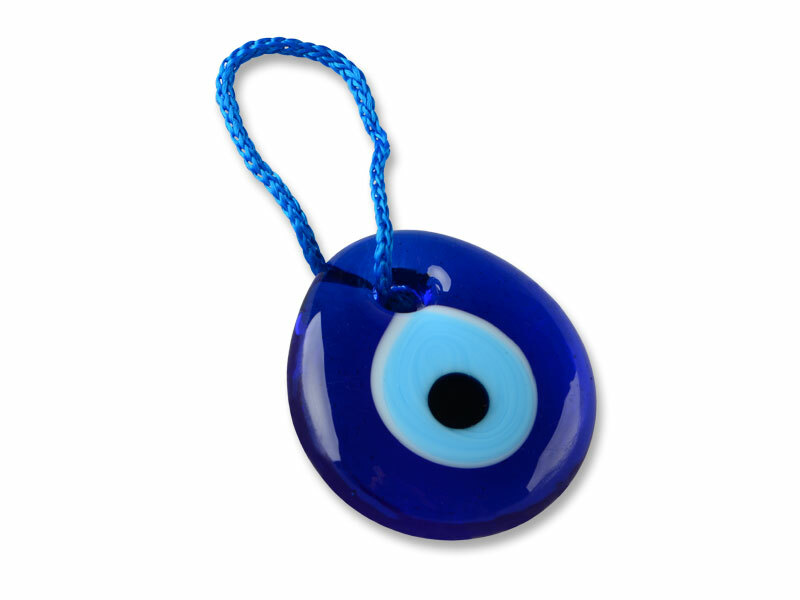 The Lucky Eye Pendant - or the Nazar Boncugu, means "evil eye bead" - is a lucky charm dating back to the Mediterranean region 3,000 years ago. 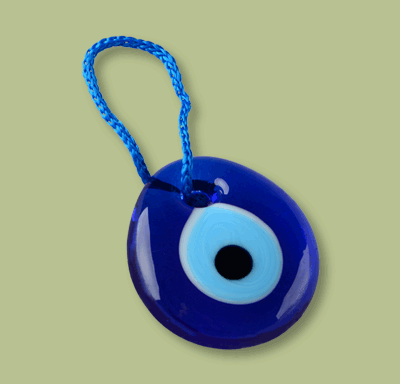 It is believed to protect from the forces of evil and deflect negative energy. This item is not made in the USA. We import the real deal from the Anatolia region of Turkey. Each glass art pendant is individually hand crafted by a glass master trained to carry on a centuries-old artistic technique. It comes gift boxed and can be made into a necklace, key chain, coat pull, or hung from your handbag. They're perfect for superstitious horse women (like Jenny). Who doesn't want some good luck to come their way? We have them everywhere – from the horse, to the house, to the car, and the barn.